With all this rainy, miserable weather, along with having a large dose of the Reading Festival blues, I decided to add a bit of sparkle to my life. 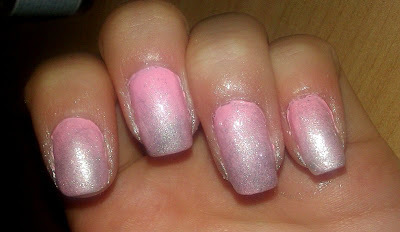 I haven't done a gradient manicure on it's own for ages, so chose this lovely pastel pink colour by 17 cosmetics for the base colour and a shimmery 2True silver for the gradient to create fun, girly nails. This manicure, as well as looking pretty, just added a bit of well-needed sparkle to disguise the state of my nails, which had been ruined by the combination of festival-fever and Primark nail wraps (they were trickier than I thought to take off). 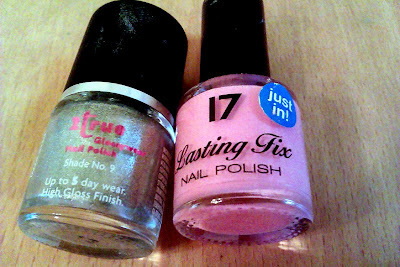 To start the look, I used my 17 ' Lasting Fix' nail varnish, a gorgeous pastel pink called 'Fairy Cake' from the 'Candy Collection' that came out a couple of years ago. 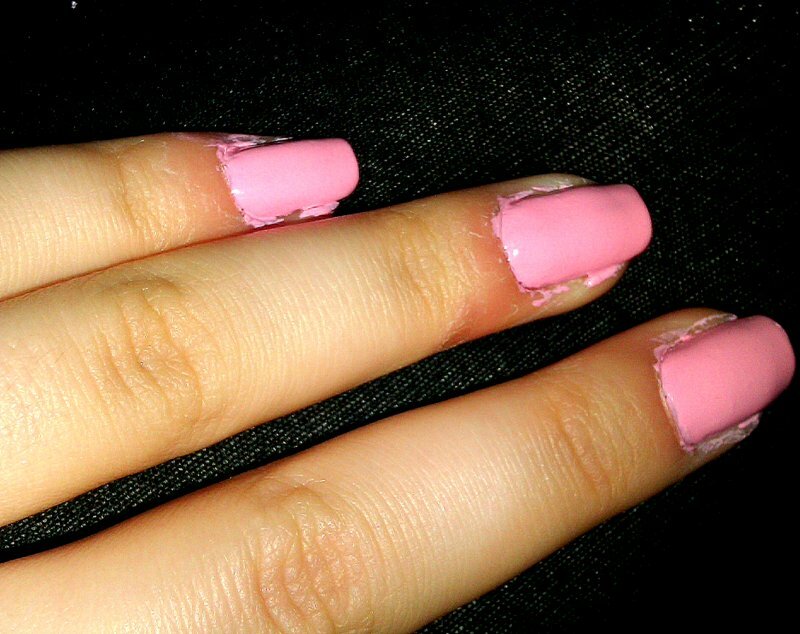 You might be able to get away with one coat of this if you wanted a paler, more pastel-like colour, but as my one is quite old I needed two coats just to get it opaque enough. Unfortunately, after two or more coats, this nail polish turns into quite a bright, bold pink rather than the pastel that's promised. That being said, it's still a gorgeous colour, and if you use it as part of a gradient manicure, you could easily get away with one coat as you'll be covering any little mistakes with the top colour. 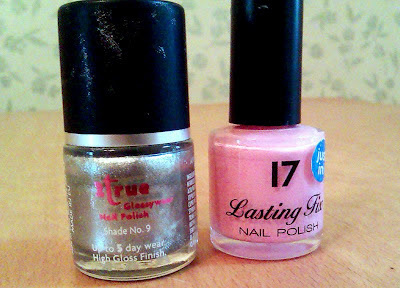 Once this had dried, I took 2True's Glossywear nail polish in shade No.9 silver and painted quite a lot on to the edge of a unused make-up sponge. 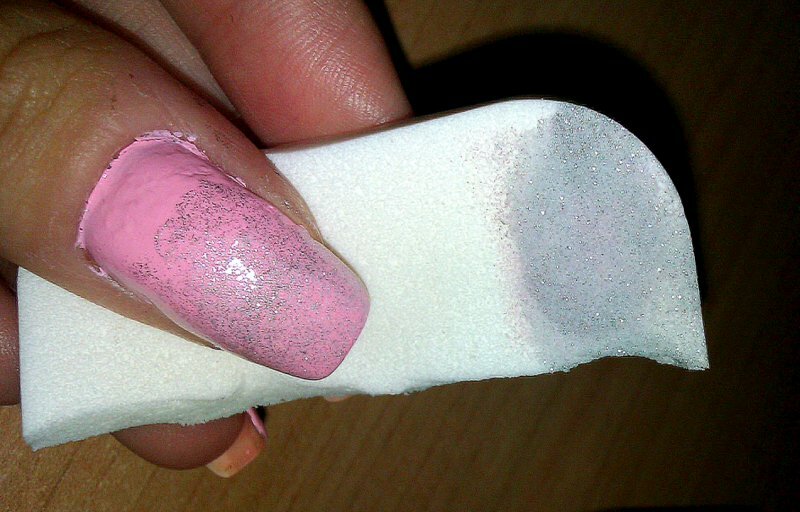 I then dabbed this onto the nail, working from the tip of the nail down towards the middle, remembering to wiggle the sponge to the sides too to cover the whole nail. The 2True polish is pretty thin, meaning that I had to repeat this process a good few times, making sure it was more concentrated at the tip and less so towards the middle of the nail to create that gradient effect. After getting the desired effect, slap a couple of clear top coats on to smooth out any bumps that may have been caused by the dabbing (beware it does feel a bit rough and bobbly to touch once you're done) and to give it a nice sleek, glossy finish. Doing a gradient manicure gets pretty messy too, so make sure you have some cotton buds and nail varnish remover at the ready. 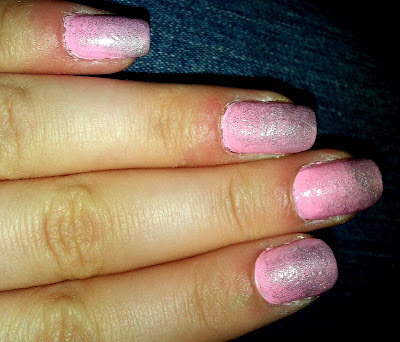 I managed to get both the silver and the pink about half-way across my hand (somehow), so used quite a few cotton buds dipped in the varnish remover just to finish off the look and clean it all up. I love this manicure, and although it takes patience with the layers, dabbing and cleaning up after, you do end up with an ultra-feminine, sparkly look that will jazz up you nails in a fun, girly way. 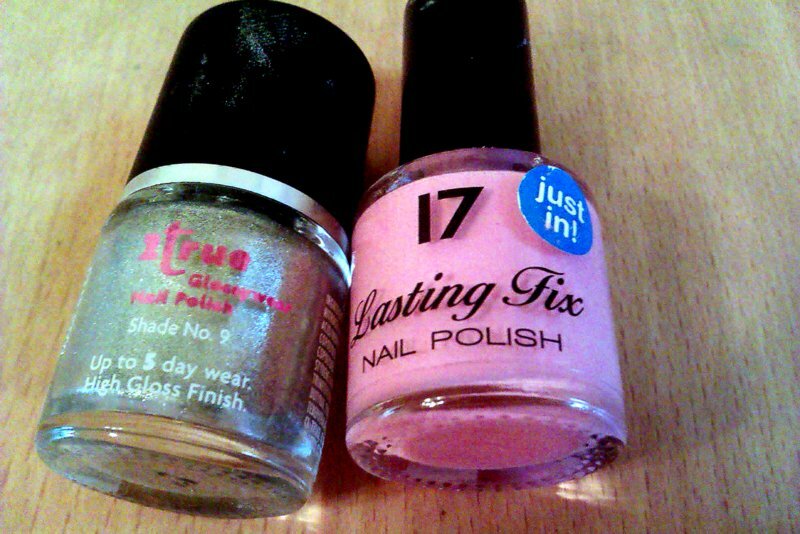 The 2True silver nail polish is available only in Superdrug for £1.99 or as part of a 3 for £5 offer, and the 17 'Fairy Cake' is available in stores for £2.99 or as part of a 2 for £4 deal.